Today the Hamburger Morgenpost has posted a full page article about Katja. They planned to publish this for two week now but finally found the spot today. The article is available online also without any images and I have also scanned the page. Katja is still ill and fatiqued from Barcelona and London (she has the flu by now for over a week). Who said poker is only fun? It is pretty damn hard for her these days. There are still the daily events of the WCOOP running but no success for us so far, except Katja made the money in the first HORSE. Katja played almost all events so far and I played a few but on Monday in the Seven Card Stud event I got so many bad beats (>20) that I lost my interest. Well, at least until Tuesday when I went to the local Casino and played the €200+10 NLH tournament while Katja played the Omaha8 WCOOP event. I was out there pretty quick by not-so-bad-beats (I figure losing with AJ vs. A5 not longer a bad beat anymore) and finally throwed my remaining money in on a draw when I was getting nearly 7:1 for my money but no rescue. 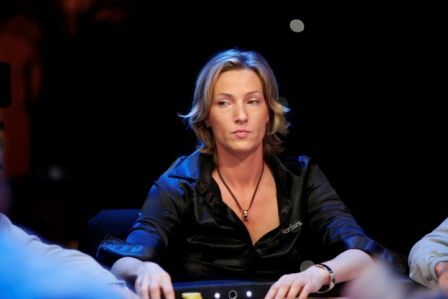 Katja made the second day at the EPT London and was placed at the featured table. Sadly she was there only for like an hour before she busted out. Her raises got no respect and she had to fold on the flop three times when she missed everything and her opponent bets into her. Finally she lost in a SB steal vs. BB-has-something situation and was out. Guys, I write about EPT and WCOOP for the german pokerstars blog every day so I am very tired about reporting what’s happening there.